The second window of Update Assist is where you determine what the user interface for your Update Assist application will look like. The following image shows the Navigation Options window. Generates a page prompting the user to enter a password to access the data in the data source. Use this option if data source security is enabled. The application will store the password in a cookie, so the user will only be prompted for it once. Generates a form in which the user selects records using a hierarchical tree control. Generates a form in which the user selects records using a combo box. 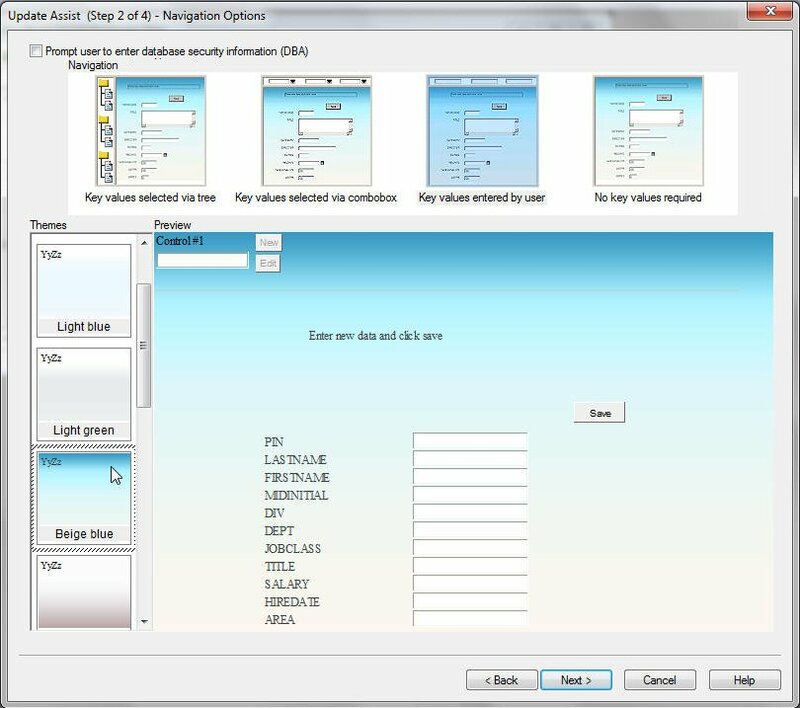 Generates a form in which the user selects records by entering key values. Note: This requires that the user knows the actual values for the key values. Generates a Maintain procedure to be called by another procedure (usually a WebFOCUS report) with the appropriate values to fill out the screen. To see how to create the WebFOCUS report that calls this type of Update Assist project, see Calling an Update Assist Procedure From a WebFOCUS Report. Adds a color scheme for your Update Assist application. You can add your own Cascading StyleSheet (CSS) to the form. You automatically see a preview of the color scheme when you select a theme. Displays the selected navigation, theme, and fields.